The race to compile genetic data is on. Gene sequencing is an important part of the science that is going to revolutionize the medical industry. It will greatly effect everything we know about diseases as well as medicine. This new research combines the worlds of life and data science. Genetic science and genetic medicine are the areas that have the most to gain from all of this new information. One city is at the heart of this modern day oil rush, is Toronto. Toronto offers one of the world’s most diverse populations, making it a great hub for gene sequencing. Advancements in computer technology and testing have made the process of gene sequencing more affordable. A process that was once outsourced overseas is now done in labs in Toronto. This will lead to an influx of information for local scientists. How Is Genetic Research Like Oil? The genetic research being done at U of T will fuel the technological revolution like oil fueled the boom in new mechanical technologies. The new information obtained by these researchers and the advancement in computational power is transforming medical research. Whole-genome sequencing allows us to understand life at its most fundamental level and also allows us to find genetic defects that lead to specific diseases. Armed with this information, genetic research allows for new diagnostic designs and precision treatments. The biggest asset to genetic science is the advancement in computational power. A whole-genome is filled with a large amount of complex information. To process this, you have to have powerful computers and specific software designed to handle the enormous amount of information. 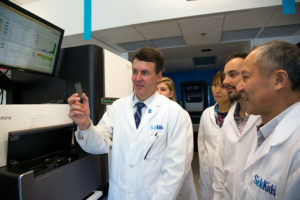 The University of Toronto was able to acquire funding to purchase the Illumina HiSeq X Ten sequencing system along with powerful computers. This combination of technology is capable of mapping 10,000 genomes a year. With further advancements in technology and science, it is a fantastic time for the genetic research industry.